Complete website solution, including web design concept, programming development, flash elements, content research & writing, photos, basic SEO & Internet marketing, domain and hosting, as well as a number of updates - at no extra charge. Opened in 1999, this old quilt factory come café-restaurant within Old Town Nicosia is a popular venue for a nice meal or drink during the week or an excellent night out, eating, drinking and listening to live classic Greek dance & rock music on weekends. A very well-known establishment among the local community (mass, elite, artists & personalities) & also popular place to visit when travelling to Nicosia from other cities in Cyprus. In fact, many famous people visit this venue during their stay in Nicosia. Since Cyprus' accession into the EU, both tourism & migration to Nicosia has increased substantially. Although market size & in turn demand has grown, so has supply. Erodos, being somewhat hidden within the mystic Old Town Nicosia & the surrounding Venetian walls, needed to boost its exposure in this constantly growing market. The Internet was the most logical choice; no doubt, the first place travellers, or new residents in the city would explore. 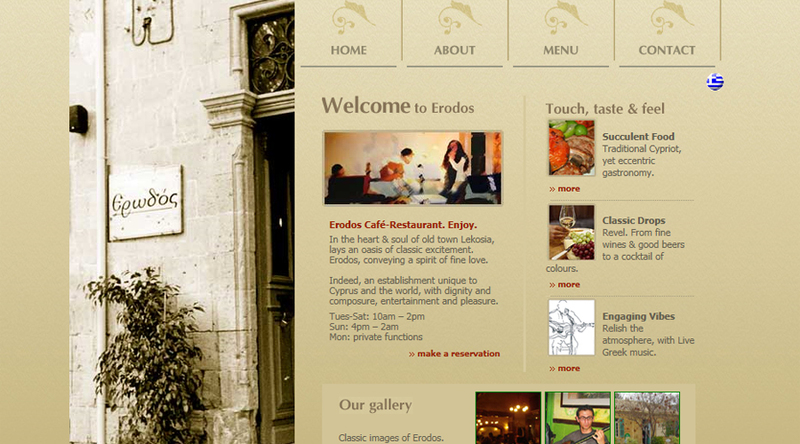 At the same time, a new website should boost group bookings, private functions & special events; all key clientele segments & major revenue generators for Erodos café-restaurant. Erodos' management had very little prior knowledge about the Internet. The main purpose was to build a website that can better promote the venue to existing customers, whilst attracting new clientele, including travellers, as well as new residents to Nicosia. Essentially, VisitErodos.com would become an online brochure, informing visitors what atmosphere & service they can expect; cuisine, beverages, entertainment (music) & overall vibe. Content, images & text had to be presented in an easy-to-navigate manner - clear, concise & interesting. Aspects such as the menu, event photos, venue's history, location & of course contact details were all fundamental. Extra special add-ons included media coverage, in this regard, acting somewhat like a testimonial, verifying Erodos' prestige & position in the local market & other links. Above all, the design & aesthetic look of the website had to represent the artistic & historic nature & feeling of Erodos - colours, structure & literature. In terms of Internet marketing & search engine optimisation, the website's written content would drive most results. Although SEO was not a primary service for this project, it was of course considered during the building of the website - as it always is with Web-Conceptions. Links from other websites point to VisitErodos.com, including major portals such as AngloInfo, CyprusNet and Wikitravel. There are also many links from VisitErodos.com to other well known websites, such Wikipedia, Keo beer & Carlsberg. The final website product was impressive. The entire design & layout was exactly as per the client's original vision. A true depiction of Erodos café-restaurant, with a good variety of images, from clear photos of food & beverages, photographs of events & the venue in action, as well as elements of more artistic impression-creating images. The website now successfully serves its purpose, with thousands of hits since its launch. Appearing in search engines via organic optimisations & through external website links on major portals, as well as on all other marketing material Erodos produces, i.e. business cards, brochures & menus. Indeed, VisitErodos is a symbol of status, making sure its presence is cemented, online & within the community.